C. J. Hopkins is an award-winning playwright, novelist, and political satirist. His plays have been produced and have toured at theatres and festivals including Riverside Studios (London), 59E59 Theaters (New York), Traverse Theatre (Edinburgh), Belvoir St. Theatre (Sydney), the Du Maurier World Stage Festival (Toronto), Needtheater (Los Angeles), 7 Stages (Atlanta), the Edinburgh Festival Fringe, Adelaide Fringe, Brighton Festival, and the Noorderzon Festival (the Netherlands), among others. His writing awards include the 2002 First of the Scotsman Fringe Firsts, Scotsman Fringe Firsts in 2002 and 2005, and the 2004 Best Play of the Adelaide Fringe. His political satire and commentary has been featured on NPR Berlin, in CounterPunch, ColdType, The Unz Review, Black Agenda Report, and many other publications, and has been widely translated. His debut novel, ZONE 23, is published by Snoggsworthy, Swaine & Cormorant Paperbacks. ZONE 23 … a darkly comic dystopian satire about being human, all-too-human, featuring two of the most endearing and emotionally messed-up Anti-Social anti-heroes that have ever rebelled against the forces of Normality. Set in the post-catastrophic future, in a peaceful, prosperous, corporate-controlled society where all dissent and non-conformity has been pathologized and the human race is being genetically corrected in order to establish everlasting peace on Earth, ZONE 23 is a hilarious, heartbreaking affirmation of the anarchic human spirit, and a defiant departure from the norms of both the genre sci-fi and literary novel. Purchase a copy from Amazon.com or a bookseller near you. 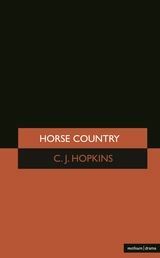 CJ Hopkins’ plays are published by Bloomsbury Publishing/Methuen Drama (UK) and Broadway Play Publishing, Inc. (US). Click on the book covers below to purchase them directly from the publishers, or visit the all-powerful Amazon corporation and purchase them there, if you feel you absolutely have to. For rights enquiries regarding Horse Country, please contact Ronald Gwiazda at Abrams Artists Agency (New York). For rights enquiries regarding screwmachine/eyecandy and The Extremists, please contact Broadway Play Publishing, Inc. For all other enquiries, contact cjhopkins [at] cjhopkins dot com. To support the production of CJ Hopkins’ political satire and commentary, please visit his Patreon page, or send a contribution via PayPal. To sign up for one of CJ Hopkins’ scriptwriting workshops, please visit The Reader Berlin.